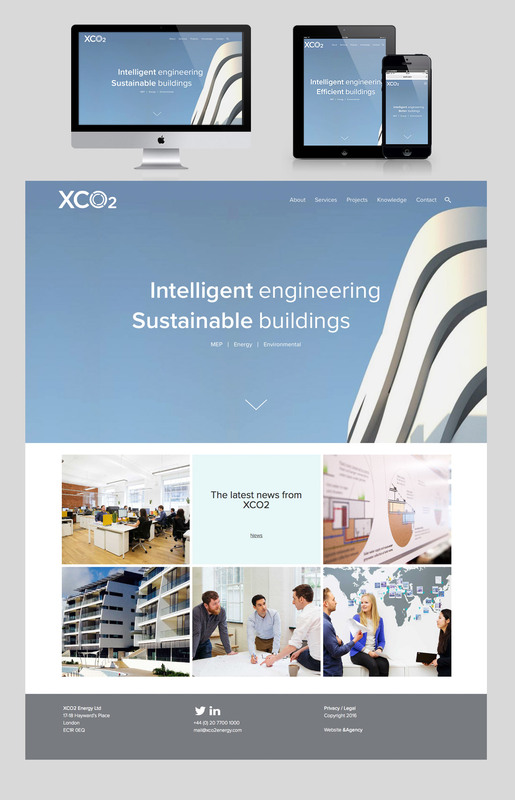 XCO2 is a multidisciplinary group with backgrounds in engineering, architecture and environmental science, working as consultants for buildings, large developments and masterplans, as well as carbon management for companies and businesses. We were approached to develop new branding, print and website for the company. The branding communicates the environmental science and engineering in the movement of the ‘O’. The old website was static, unresponsive on mobile, difficult to update, had a separate blog and didn’t communicate clearly. The new website has been developed to reflect the core values of XCO2. The homepage features a transition of words that summarise the companies ambitions, with thumbnails leading to key ares of the site below. XCO2 were keen to show the social side of the company, we introduced a ‘Culture feed’ into the About section. We art directed and commissioned photographs of the office and the staff members, who subtly change position on rollover, bringing personality to the site. Projects can be filtered via Sector, Service or Location, with a styled google world map showing the projects below. We encouraged XCO2 to make more of their blog by introducing a Knowledge section, broken down into News, About and Opinion – their new blog. Alongside the website we designed and developed a full range of working templates, including CVs, Reports and Stationary.